This summer we have focused mainly on using the Swedish Bible Study Method. It’s focus is on making good observations and easy applications for a passage. The value of the Swedish Method is also that it is easy to memorize with the picture symbols. We now look at a method called COMA. COMA is like a little more in depth. It is built on the basics of Observation, Interpretation, Application (OIA). This is a great tool to help us to go deeper into the word while helping us not misinterpret a passage. It starts by with a bigger picture of a passage and then going deeper and deeper. Context: The first step has the student looking at not just the content passage they are studying but looking at the bigger context to make sure we don’t remove and interpret a single passage from the rest of its letter or the whole of Scripture. Historical Context: What can we learn in from this passage about what the culture is like or what the audience is experiencing? What’s the circumstances or situation related to why the letter or book might have been written? What does this passage say about the author or audience’s situation? Literary Context: What genre is the book? What literary features does the writer use? What images, comparisons, or metaphors are used? Are there any connecting words used (for, therefore, but, etc) that might help link the passage to another with a logical flow? What comes before or after this passage in its book/letter? What was the passage just before talking about? What was the main point? What was the theme or logical connection that led to this passage? What “jumps” out to you in the passage? Repetition – is there a word, phrase or idea repeated to show an emphasis. Lists – How are items in a list arranged? What might the author be doing with a list and what’s the intended message in using a list that way? Images, Comparisons or Metaphors – The Bible is FULL of images used to communicate ideas or thoughts that might otherwise be difficult for people to understand. God gives us images all throughout Scripture to communicate his ideas so what might be communicated in this passage if something is compared to something else? What surprises are there in the flow of the argument? What shocked you by the way the author presented something. Meaning: Here we are trying to get to the “heart” of the passage and interpret the meaning of the passage. We don’t want to bring a meaning to a passage, but rather we want to search out the meaning from the passage! We want to get as close to the author’s intended meaning as possible. Again, this is God’s Word, spoken through theses writers so we want to know what God intends for us to know rather than what we want a passage to say. How does this text relate to other parts of the book? How does this passage relate to Jesus? What does this teach you about God? How does this passage challenge (or confirm) your understanding? Is there some attitude you need to change? How does this passage call on you to change the way you live? So that’s the COMA method in a nutshell described in a book by David Helm called One-to-One Bible Reading. 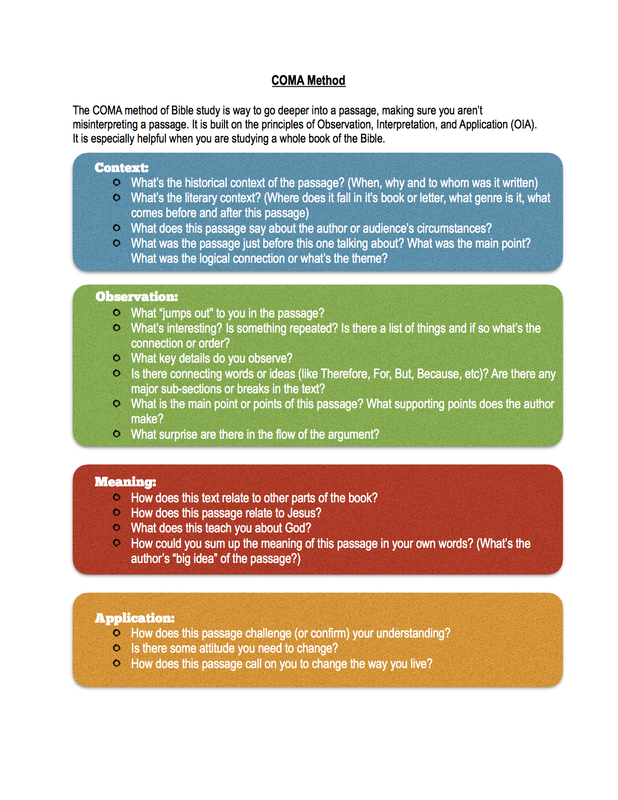 Check out Matthias Media for a great handout that takes this method and focuses the questions based on what genre of Biblical literature you are studying (Gospels, Narrative, Wisdom, Prophetic, etc). You can check it out here. Here’s a quick summary handout I made you can use to start using the method.